Pakistan is mounting an official protest over U.S. drone strikes on its northwestern tribal areas, a day after several American diplomats were detained when a cache of weapons were found in their vehicle at a routine check at the Peshwar Motorway toll plaza. Since President Barack Obama and Pakistani President Asif Ali Zardari attended a NATO summit in Chicago on May 21, eight drone strikes on Pakistan have been ordered by the U.S. most of which were carried out in the last two weeks, giving rise to massive protests and mounting tensions in the region. Pakistan has strongly condemned the spike in the atrocities over the past few weeks. The Pakistani foreign ministry considers the attacks “illegal” and says they violate the country’s sovereignty, while the U.S. maintains they are legal under international law. Pakistan’s Dawn.com reported that four M4 assault rifles with 36 magazines and four pistols with 30 magazines were found in the car Monday. The U.S. Consul General, Mary Richard, traveled to the police station where the Americans were being detained for questioning. She urged Pakistani officials to confiscate the weapons and release the diplomats. A total of six people were detained, including three American diplomats, and three Pakistanis — a security guard and two drivers. The Americans were quickly freed, while the status of the Pakistanis was not clear. Dawn also reported that the Khyber Pakhtunkhwa government prohibits foreign diplomats from carrying weapons or travelling to prohibited areas in the province unless permitted by the provincial government with a No Objection Certificate (NOC). On Tuesday, Pakistan’s Foreign Office said Richard Hoagland, the U.S. charge d’affaires, “officially conveyed the government’s serious concern regarding drone strikes in Pakistani territory.” Pakistan summoned the senior U.S. diplomat to officially protest drone strikes, which killed 15 people in drone strikes in western North Waziristan region on June 4. Between Saturday and Monday alone, three attacks in tribal areas along Pakistan’s border with Afghanistan took place, Reuters reported, and reports surfaced from Pakistan officials saying that 30 people were killed during the sequence of strikes over the weekend. Abu Yahya al-Libi, a senior al-Qaeda figure, was the target of the strike. America regarded the Libyan citizen as al-Qaeda’s second-in-command. Libi was confirmed dead by U.S. officials speaking on condition of anonymity to media outlets Tuesday, but Pakistani officials were mum. Tensions between the two nations have been mounting and intensified since November when 24 Pakistani soldiers were killed by cross-border “friendly fire” from a NATO aircraft. This caused Islamabad to shut down overland supply routes to NATO forces in Afghanistan. Since then, relations between Washington and Islamabad are at their lowest point in years and Pakistan is reviewing its ties to the U.S. The countries remain in negotiations over reopening the routes, considered vital to the planned withdrawal of U.S. troops from Afghanistan before 2014. “The United States is conducting, and will continue to conduct, the counter-terrorism operations it needs to protect the U.S. and its interests,” an American official, on condition of anonymity, told Reuters. Pakistan’s government has said the drone campaign is fueling anti-American sentiment across the country and is counterproductive because of the collateral damages produced. Pakistan’s parliament has called for an end to U.S. promulgated drone strikes. 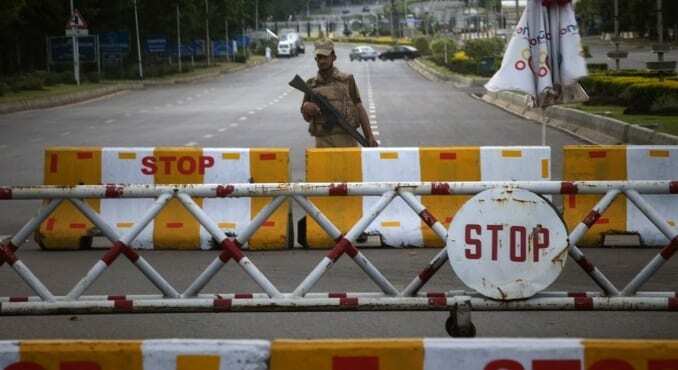 In April, a foreign minister from Pakistan said that the United States was ignoring Islamabad’s demands for an end to the operations, according to Reuters. Pakistan has warned the U.S. that the drone strikes are driving angered Pakistanis to join militant groups. This entry was posted on June 6th 2012 at 3:12pm/15:12 and is filed under Live News Column 1, World News. You can follow any responses to this entry through the RSS 2.0 feed.